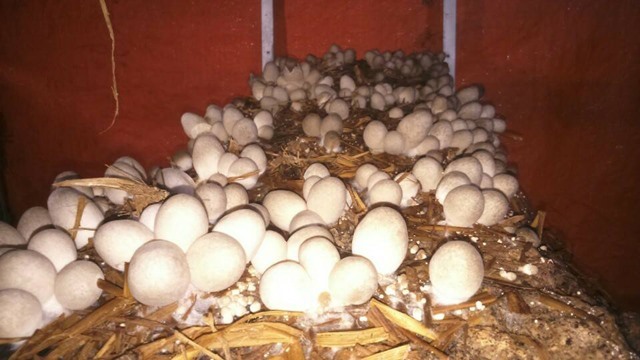 ĐỒNG THÁP — Lai Vung District, the largest straw mushroom producer in Đồng Tháp Province, is encouraging farmers to grow the mushroom indoors saying it offers better results. In the Mekong Delta, where Đồng Tháp is situated, farmers who grow the mushroom indoors harvest twice the amount because it is no longer affected by the weather and farmers can control the temperature and moisture content. This also ensures it is of higher quality and clean, according to farmers. Ngô Tấn Dũng, who grows the mushroom in four houses in Lai Vung’s Hòa Thành Commune, earns VNĐ12 -15 million (US$510 - 640) per crop. He pasteurises rolls of paddy straw and mixes mushroom spawn into the straw and waits for a week to 10 days to begin harvesting the mushrooms, he said. The harvest lasts more than two weeks. He harvests two to three kilogrammes in each paddy straw roll. Hòa Thành Commune has 12 households that grow mushrooms in 40 houses. Its indoor straw mushroom growing co-operative has signed a contract with a company to sell its produce in March last year. The district has about 60 houses with an average size of 25sq.m. The province’s Agriculture Extension Centre has helped farmers build the houses and taught them farming techniques. Nguyễn Văn Cường of Hòa Thành Commune’s Tân Hòa hamlet was provided a subsidy of 30 per cent of the cost of the house he built measuring 20 metres by 5 metres at a cost of VNĐ100 million ($4,300). It has become a place for other farmers to visit and learn the indoor mushroom farming model. The district’s Agriculture and Rural Development Division organises training courses for local farmers. In Lai Vung, straw mushrooms are farmed in rice fields, orchards, along roads, and inside houses. Hòa Thành and Vĩnh Thới communes and Lai Vung Town have the largest areas growing straw mushroom in the district. The district estimates output to exceed 9,000 tonnes this year, 5,000 tonnes more than last year, according to the division. The price of mushroom has been high and steady this year. This year traders have been buying straw mushrooms grown outdoors at an average price of VNĐ45,000 ($1.9) a kilogramme and those grown indoors at VNĐ50,000 – 60,000 ($2.1 – 2.6). The former fetches farmers an income of more than VNĐ10 million ($430) per 1,000sq.m per crop, and the latter, VNĐ10-15 million ($430 – 645).